Light pink and turquoise (mint more so, but I seem to lack mint clothing) are colours that seem to scream springtime. Staying with that mood, to emphasize the lovely weather we're having as of late, I decided to add a floral skirt and a lovely sequinned Thumper tank! 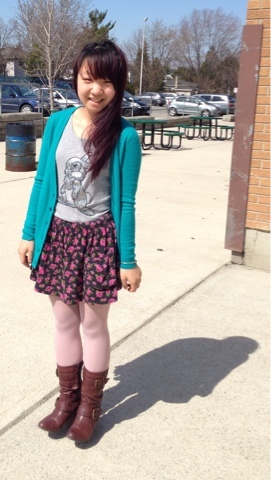 It's time to pull out the tights, in light bright colours! Spring should be celebrated with pretty legs that have been kept mostly hidden all winter long, but it's a tad to cold to go bare legged right now. So colourful tights are perfect! Being in pastel colours makes it a little easier to not seem so ridiculous, as the colour is j h more subdued than a typical coloured tight would be! 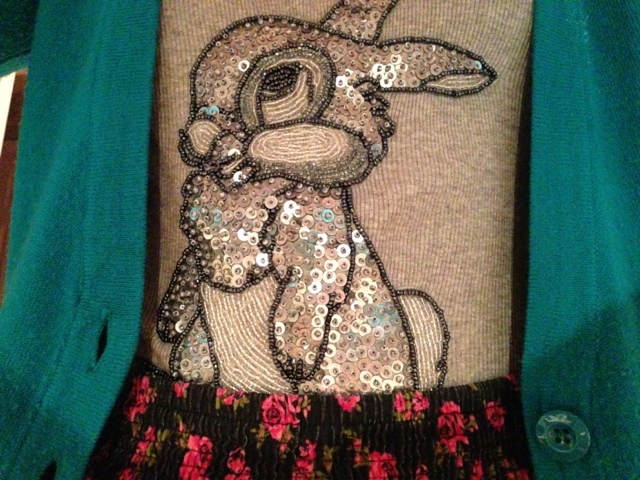 Furthermore, don't shy away from sequins and Disney/cartoon graphics! With the right touch of sophistication and a good eye, you can keep it fun and flirty - not radically ridiculous! Too much in the past.